32 (36, 40, 44, 48)" bust circumference. Sweater shown measures 32", modeled with no positive ease. -Finished Size 32 (36, 40, 44, 48)“ bust circumference. Sweater shown measures 32”, modeled with no positive ease. -Yarn Lorna’s Laces Shepherd Sport (100% superwash merino wool; 200 yd 183 m/2 oz 57 g): #60ns waistcoat, 7 (8, 9, 10, 11) skeins. -Needles Sizes 2 (2.75 mm) and 4 (3.5 mm): 24” circular (cir) and set of double-pointed (dpn). Adjust needle size if necessary to obtain the correct gauge. -Notions Markers (m); stitch holders; tapestry needle. -Gauge 24 sts and 36 rnds = 4” in St st on larger needle. 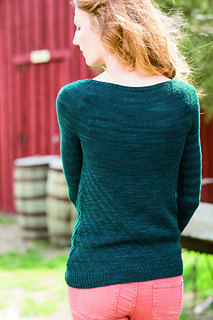 Targeted increases and decreases create diagonal lines in this seamless pullover. Sweater is knit in the round from the bottom up.